Holistic Dentistry is sometimes called “Biocompatible” dentistry and includes a dentist’s avoidance and elimination of toxins from dental materials. Biocompatible materials that are used in the mouth agree with your immune system. Dr. Peter Ciampi is committed to his patients’ well being and only uses biocompatible materials in his practice, Spring Lake Smiles. Unsafe materials, such as amalgam are still used in dentistry today. However, Spring Lake, New Jersey’s Dr. Ciampi voluntarily chose to eliminate all metals and mercury years ago to ensure his patients’ safety and health. 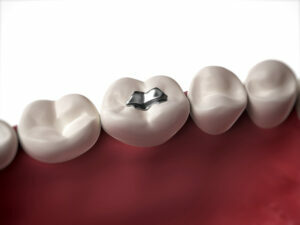 Amalgam is a material commonly used as filling material for teeth. It contains the toxic mineral mercury. Mercury has been proven toxic and unsafe. When used as tooth filler it introduces an incompatible, harmful substance into the body. To understand the toxicity of mercury one can go to the leading government organization in environmental protection, the Environmental Protection Agency (EPA). The EPA first banned mercury in paints in 1991 and designated it as toxic poison. You may wonder if it is considered too toxic to be put on our walls why it is still permissible to use it as a prominent fixture in our mouths. This question remains. Economics does play a part, as amalgam fillings are less expensive, which can appeal to patients, as well as some dentists. Perhaps mercury is best known for its reputation for tainting the fish we eat. Warnings are consistently in the news about fish taken from the ocean, lakes and streams containing mercury and the potential health problems if eaten too frequently. Mercury continues to be linked to a number of health conditions and fatal diseases. Recent studies at the University of Kentucky show a high correlating level of mercury in the brain cells of Alzheimer’s patients. Although it is still legal to use mercury in dentistry, there are enforced requirements regarding how to safely dispose of it. Dental offices are required to use safe filtration and disposals systems when discarding the material. Dental office waste is required to be filtered before being dumped in municipal sewage to help lessen the possibility of it becoming tainted with toxins. Again, the question of our safety arises. If special filtration is used to dispose of mercury, is it safe to be in our bodies at all? Other metals besides amalgam don’t get a clean bill of health either. Heavy metals and other unsafe minerals that are found in dentistry, such as nickel, cadmium, aluminum, chromium and cobalt, are also considered toxic and can affect the immune system. The suggested procedure for patients who have metal and mercury containing dental work is to have it removed by a qualified professional and safely disposed of. Following removal, the areas can then be refilled or restructured with non-toxic materials. Our tooth-colored fillings or porcelain crowns procedures are just two examples of the mercury free dentistry we offer.